DEWALT DC385B 18-Volt Cordless Reciprocating Saw is one of the best rated reciprocating saw in the market currently. Featuring a powerful motor that offers up to 3000 strokes per minute(SPM), the DEWALT 18-Volt Cordless Reciprocating Saw makes a good choice for anyone looking for good performance. It also comes with a variable speed motor that allows the speed to be adjusted for varied applications. This saves a buyer the headache of having to buy a couple of saws for different uses. In addition to making blade changing easy, the 4-position blade clamping system also improves flush cutting reciprocating saw. For maximum visibility, the DEWALT Bare-Tool DC385B 18-Volt Cordless Reciprocating saw comes with an adjustable shoe and a keyless blade clamp. You will also appreciate improved handling courtesy of the lever-action keyless blade clamp and anti-slip rubber handles. Stopping the saw’s blade is made easier thanks to the electric brake plus trigger lock. 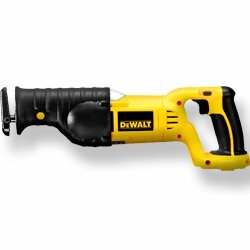 The saw is quite versatile and can be powered by DC9096 or DC9180 lithium-ion batteries, and charged using DCB103, DW9117, DC9310, DC9319, DC9320, or DC012 charger. The above features and benefits give the saw a rating of 4.6 out of 5. Users can lift, reach and extend to how much ever length they need. Milwaukee 2625-20 Reciprocating saw got a huge number of reviews from the customer and thus a best rated reciprocating saw. Milwaukee 2625-20 Reciprocating saw powered by a motor that delivers 0-3000 strokes per minute. 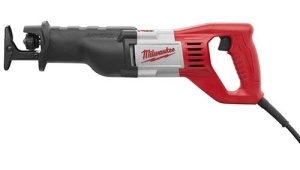 The highly versatile Milwaukee 2625-20 M18 18v Cordless Recip Saw can saw through boards, fiberglass, PVC, wood, leather, masonry and many other surfaces. Its batteries are very durable and tend to last quite a while under continual use. And they charge up pretty fast. For faster cutting and better output, the Milwaukee reciprocating saw features a 3/4-inch stroke that operates at different speeds depending on the selected range. Similar to other Milwaukee saws in the same class, this saw relies on patented QUIK-LOK mechanism for easy changing of the blade. The one-handed cordless saw delivers superior performance and accuracy courtesy of the anti-vibration gear system. It’s also among the lightest and compact saws in its category. 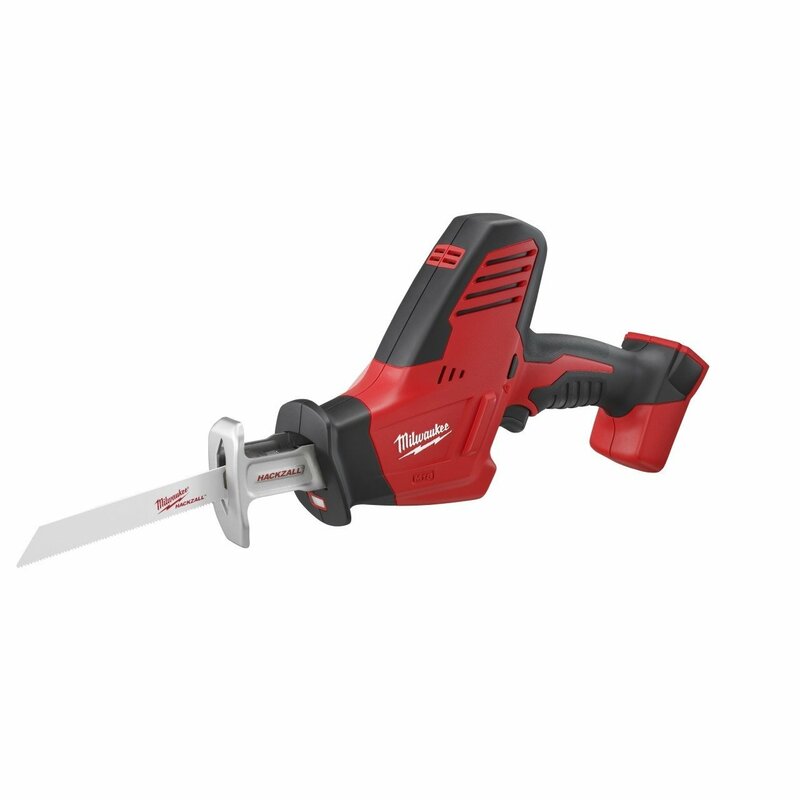 Reciprocating saw reviews tend to talk about how small Milwaukee 2625-20 is compared to other models on the market. Unfortunately, it comes as a bare tool and a buyer has to incur an extra charge for buying the battery(s). Nonetheless, with a good Amazon score, this saw leads the pack as one of the best reciprocating saw in the market. The Bosch RS7 reciprocating saw is best suited for people who are looking for a multi-function power saw. The new Bosch RS7 1-1/8-Inch 11 Amp Reciprocating Saw is designed with ease of cutting in mind. Coming with a new improved design and delivering 11 amps of cutting power, the reciprocating saw is suited for cutting light to medium strength products. The ultra-light cutting tool is easy to use in tight corners especially considering it comes with LED lighting for improved illumination. Removing or changing the blade is much easier compared to most tools in the market thanks to the tool-less blade changing mechanism. And to guarantee you of good control, the saw features a variable speed trigger and a tight-grip and comfortable handle. Good ergonomic design plus saw hook for easy storage is other aspects that make this corded reciprocating saw ideal for new as well seasoned users. The sturdy tote protects the saw when transporting it between job sites. People’s looking for a heavy-duty recip saw will be disappointed by the saw’s power and also it’s not the cheapest in its category. But this doesn’t stop the RS7 scoring a convincing 4.6 out of 5. When you purchase Bosch RS7, you will also get an all-purpose blade and a carrying case. Makita BJR182Z 18-Volt Cordless Reciprocating Saw is now in a position of best rated reciprocating saw. Coming from one of the renowned power tools manufacturers, the Makita BJR182Z 18-Volt Cordless Reciprocating Saw is ideal for light to medium-light cutting. The 7.9-pound saw runs on an able motor that provides 0 to 2900 strokes per minute (RPM). To make cutting less of a hassle and more effective, the saw features variable speed control as well as a soft grip handle. Similar to many Makita recip saws, the BJR182Z also comes with a toothless blade change mechanism for quick and efficient blade changing. The 1-1/8″ length stroke boosts the saw’s cutting efficiency while its small and compact design minimizes fatigue or discomfort, especially when used for a long period. Courtesy of a versatile and reliable LXT Lithium-Ion battery, the saw can be used for a longer time than most saws in the market. The 18-volt recip saw is charged by a Rapid Optimum Charger that delivers 430% total lifetime work plus 3-times more cycles. Unfortunately, it comes as a bare tool only and no batteries are included. This is why the saw attains a score of 4.7 out of 5. 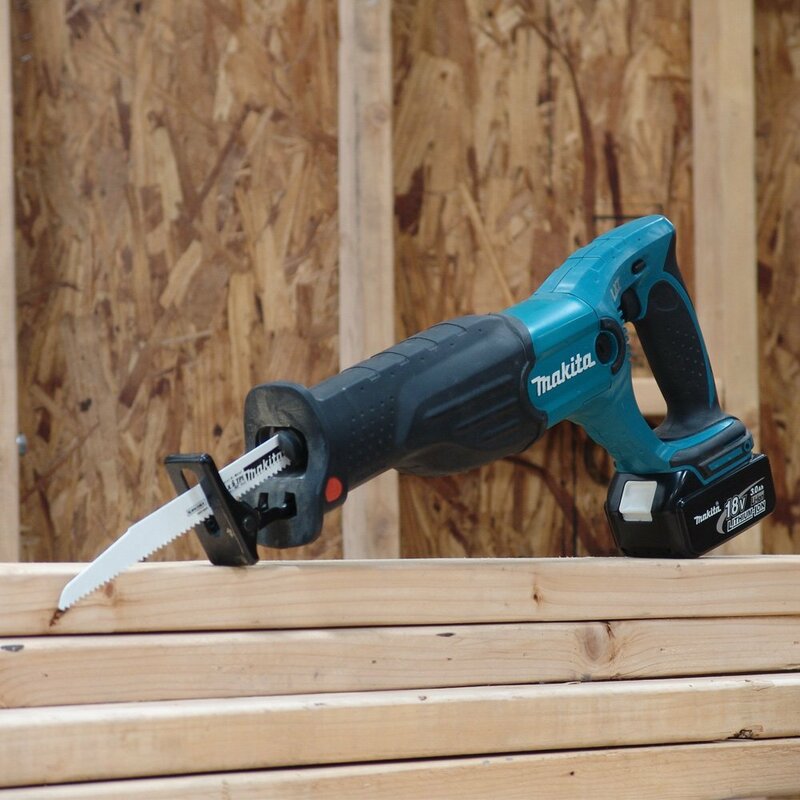 Although for a cordless reciprocating saw, the Makita BJR182Z is great. If you are looking for a saw to handle all your homestead projects, this will be a handsome choice. Running on a powerful 10-amp motor, the DEWALT DWE304 10 Amp Reciprocating Saw is suitable for light and medium-duty applications. The price-performance is excellent. It comes in a new and improved design that enhances handling as well as comfort. Operating at 0-2800 strokes per minute, the tool is ideal for varied applications such as wood; nail embedded wood, drywall, light metal, heavy-gauge metals, plastic, plaster, rubber, marble, composites, fiberglass and more. The 4-position blade clamp mechanism allows for flush cutting while the keyless lever-action clamping systems allow for quick change of the blade. Together with the variable speed trigger, the 1-1/8″ stroke length allows this corded saw for faster and more efficient cutting as well as better control. The saw seems underpowered compared to saws in similar categories and cutting heavy-duty metal may be a challenge. It features a cord which means its area of operation is restricted. It is sold at a great price and you will like it very well. So with an amazing score of 4.8 out of 5, the saw is worth the time and money. For the typical homeowner, this saw seems perfectly adequate. It is a user-friendly and fast cutting machine. The Milwaukee 6519-31 12 Amp Sawzall Reciprocating Saw Kit is regarded as one of the best tools in the market. There are many things to like about the new Milwaukee 6519-31 Reciprocating Saw. Powered by a 12-amp motor, the saw operates from 0 to 3,000 strokes per minute. For ergonomics and comfort, it is unsurpassed in its class. It operates on 1-1/8-Inch stroke length which is ideal for most applications in the home, office, workshop, and many other settings. To guarantee you of smoother operation and longevity, the 6519-31 12-Amp Reciprocating saw features gear and motor protection. The QUIK-LOK blade clamp remains in place even during high-impact application while the counter-weighted mechanism guarantees you of smoother operation. To minimize excessive vibration, wear and tear, and accidental slippage, Milwaukee recip saw comes with a redesigned front grip, more ergonomic design, and soft finish. It comes with a counter-weighted mechanism that reduces vibration. The motor is engaged by a trigger switch which you control with your index finger. Chances of numb fingers, the saw slipping away, or sweaty and tired and are minimal thanks to the soft-grip and comfortable handle. The saw isn’t suited for heavy-duty such as cutting concrete or heavy-gauge metal. All in all, It is a great tool for your toolbox. The above review summarizes some top rated reciprocating saw. They are quite versatile and are suitable for a range of applications. What’s more, they are designed with user-comfort, safety, speed and accuracy in mind. If you are looking for the best rated reciprocating saw in the market, you will find any of the above saws quite handy. For safety, the operator needs to know exactly how to use it.